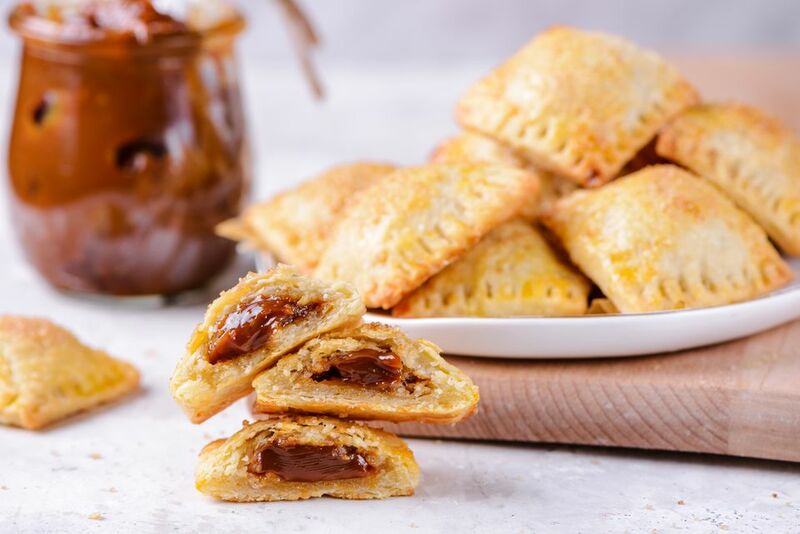 These little bites of pastry filled with dulce de leche are a special treat. We like to make pastelitos de dulce de leche when we have leftover scraps of pastry dough. Especially after rolling out a pie crust. But they are so delicious you will want to make a whole batch of pastry dough dedicated only to these little cookies. It's difficult to keep the dulce de leche from leaking out during baking, but don't worry about it. When the leaking dulce de leche pools around the pastries in the oven, it gives them a delicious candy crunch on the bottom. Frozen puff pastry dough works well for these pastries too. Add the flour, salt, and sugar to the bowl of a food processor and pulse briefly. Add the butter, cut into 1 tablespoon pieces and the cream cheese (also cut into pieces) to the bowl and pulse several times, just until mixture starts to come together. Add the vanilla and pulse twice more briefly. Turn dough mixture out onto a piece of plastic wrap. Bring dough together into a disc, wrap with plastic, and chill for at least 2 hours or overnight. Roll out dough on a floured surface, to a thickness of about 1/4 to 1/8 inches and cut into 2-inch squares with a sharp knife. Place a small dab of dulce de leche (a little less than a teaspoon) on half of the squares. To cover the squares with the dulce de leche, wet one finger and run it around the edge of the pastry dough with the dulce de leche. Top it with another square of pastry, and pinch edges together, extending them slightly as you do. Repeat until all of the pastries have "tops." Take a sharp knife and trim the edges of the pastries slightly, so that they are perfect squares. Chill pastries well, at least one hour. Whisk the egg yolk with a teaspoon of water. Press the edges of the chilled pastries together with the tines of a fork, being careful not to pierce the filling. Brush the pastries with egg yolk, and sprinkle with the cinnamon sugar. Bake pastries for 10 to 12 minutes, until puffed and golden brown.